March | 2009 | Ipoh Mali Talak Sombong! 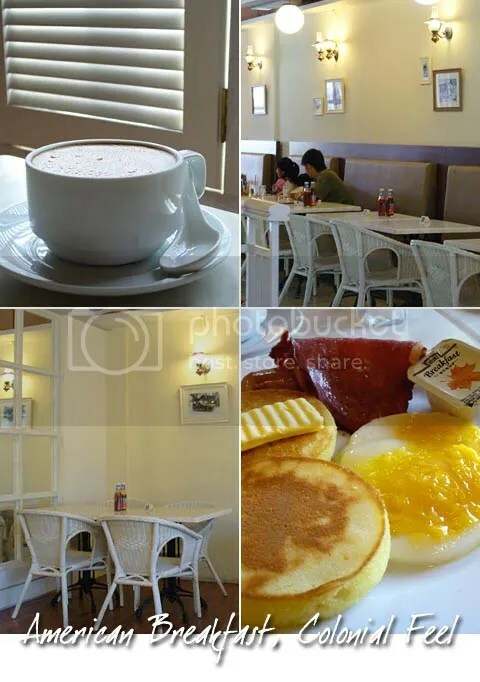 Looking for a place to have breakfast on a sunny Sunday? Now, if I say that there’s a place in PJ, air-conditioned, complete with wifi and serves local and western breakfasts with unbelievably reasonable price, would you believe me? If I were you, I might say “No way”. That was my reaction when Daniel told me that Tappers Café at Jaya One has one of the cheapest pricing on its food menu last month. In order to prove that he’s correct, he dragged me there one sunny Sunday morning early this month. The ambiance was simple – wooden floors, white walls, white marble tables and white rattan chairs with small black & white photo frames and antique-designed lamps adorned the walls. There were a few tables occupied when we walked in but the place was almost full by the time we left. Take a quick peek in the menu and your jaw will literally drop. Why? Because of the price lor. Where can you get Mushroom Omelette at RM 3 or two Fried Egg Toast at RM 1.50 in an air-conditioned environment? But do keep in mind though, that their portions aren’t big. While I settled with an American Breakfast set at RM 7.90 that came along with a cup of hot coffee, Daniel went for English Breakfast set, also RM 7.90 with a cup of hot tea. Kim Siong, who doesn’t eat meat, had the Mushroom Omelette (RM 3, scrambled eggs with mushrooms), two Fried Egg Toast (RM 1.50) and Hot Honey Lemon (RM 2.80). Instead of normal toasts, I got two pieces of nicely done pancake (very fluffy and fragrant!) with maple syrup and butter, a fried egg, bacon and sausage (how wrong can it go with these stuff by the way?). Total damage for the three of us came to RM 22.30, no service charge or government tax. 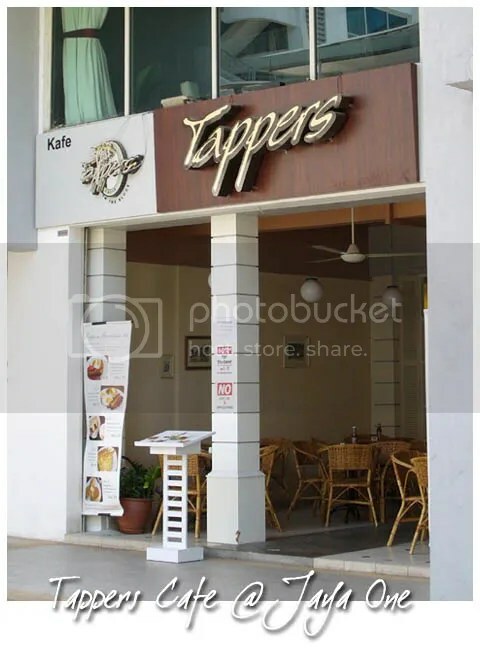 The food were undeniably not bad, however the same thing cannot be said to their service. We waited quite a while, about 30 minutes for our first order to arrive. And when Daniel enquire the waitress, she replied in a rather impolite way (from her accent, we thinks she’s not a local). But I will sure be back again, considering the cheap price tags. *Students gets 10% discount off. 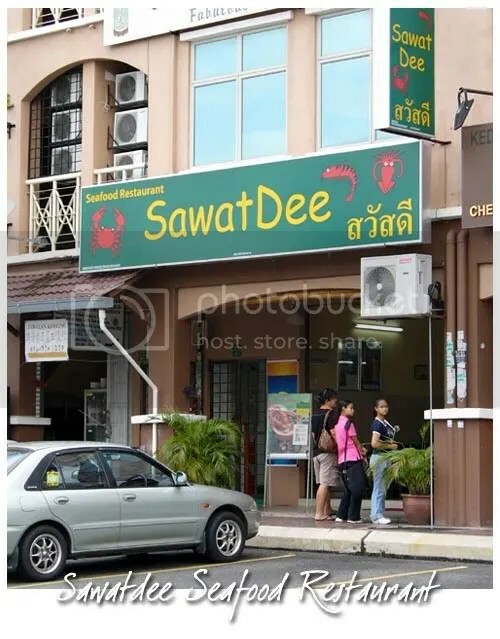 *Notice: Sawatdee has since been closed down for business. This is suitable to be served as appetizer or salad, the Deep Fried Prawns with Cucumber Salad was light and attractive. 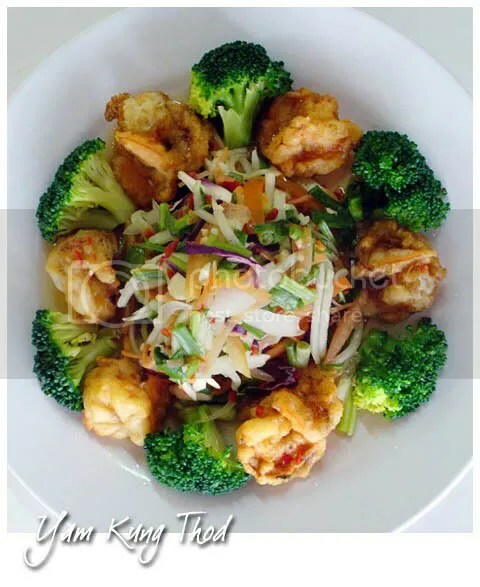 The tangy cucumber salad lent a refreshing taste to the deep fried prawns. 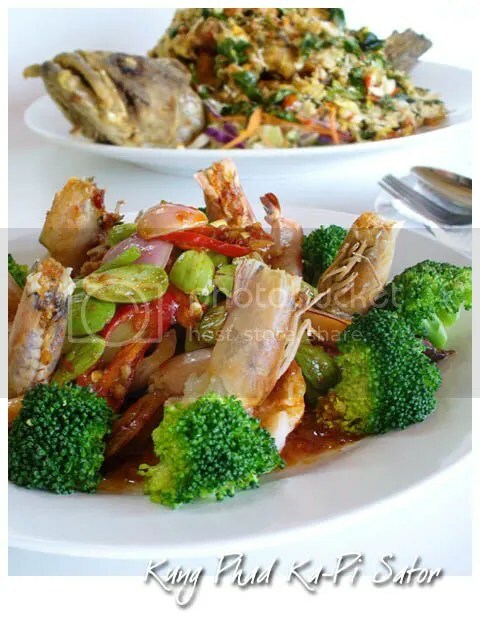 Translated as Sawatdee Special Batter Prawn, this dish can easily feed 4-5 person. 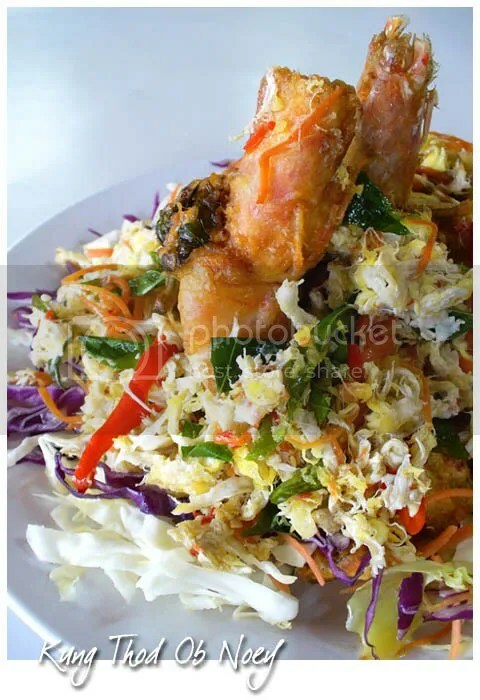 Battered and deep fried medium-sized prawns were tossed together with plenty of vegetables such as sweet basil leaves, julienned cabbage, carrot and egg. 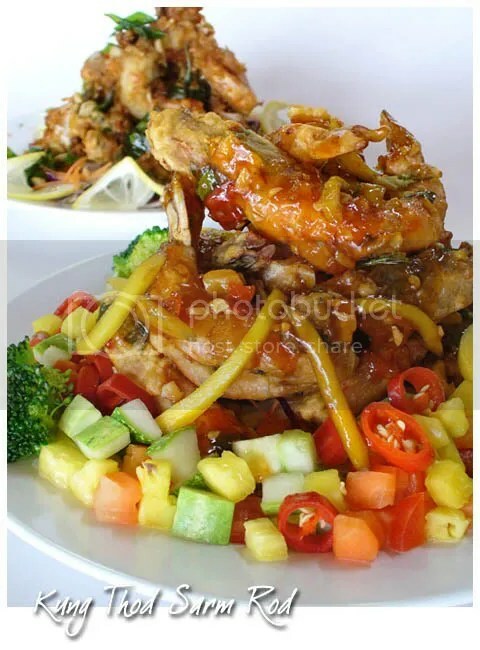 Deep Fried Prawns with Thai Chilli Sauce – basically cooked the same way, and served with a sweet and spicy concocted by Somjit herself on a bed of diced cucumber, pineapple, chilli, tomato and ginger. 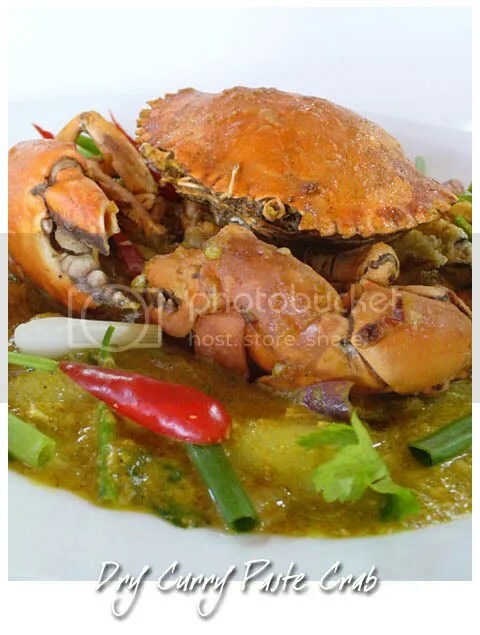 This is similar with the Stir Fried Crab with Curry Powder, except this was done with a bit of gravy. A simple stir-fry dish that resembles our local Malay’s, Stir Fried Prawns with Petai in Shrimp Paste (belacan). Somjit uses a bigger sized prawns for this dish. 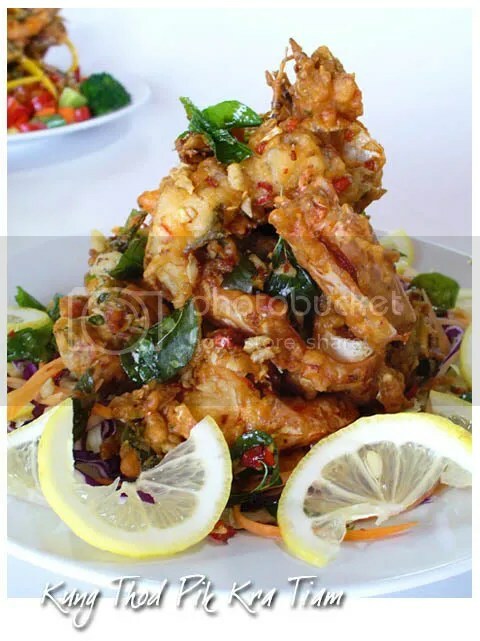 If you wanted something more appetising and spicy, try the Deep Fried Prawns with Spicy Garlic and Sweet Basil Leaves. The garlicky smell didn’t overpowering the dish and the prawns were coated in a thin, sticky and spicy sauce. 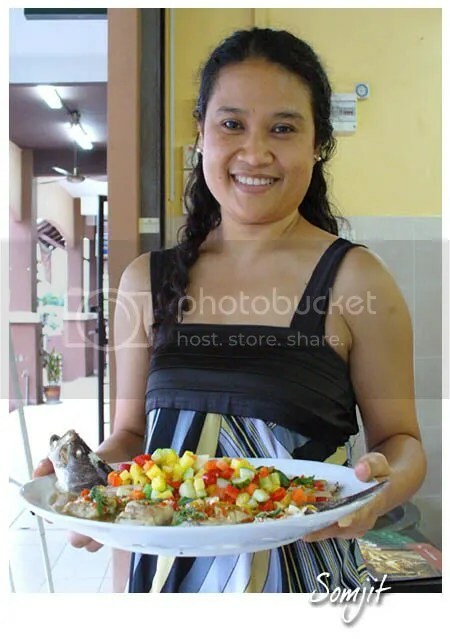 And finally, if you’re wondering how does the owner looked like, here a picture of her. This petite lady exudes a friendly aura with her heart-warming smile and gentle gestures. The F&B industry might be tough but she’s proud of what she’s doing and believe that her hard work will eventually paid off someday. Hi guys, hope you had a good weekend. Mine was okay; went to watch Seven Pounds by Will Smith on Saturday morning (the storyline was kinda confusing and chaotic) and had a small, cozy dinner with friends on Sunday night. Since I got access to all the kitchen equipments here at my new place, I’m gonna post up some of my culinary experiments once a while. 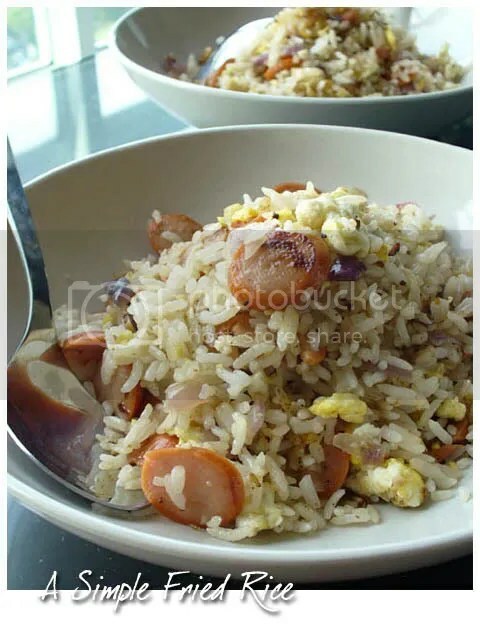 This is what I cooked before movie on last Saturday – a simple and quick fried rice. 1. Heat up cooking oil, sauté the garlic till fragrant, add in the onions. Lower the heat and stir till onions softens. 2. Throw in the sliced frankfurters, oyster sauce and stir fry till the meat are cooked through. Break in the eggs, add salt, pepper and sesame oil. 3. Add rice, increase the heat and stir till everything are evenly mixed. Dish out and garnish with chopped spring onion (I don’t have any, so there was no garnishing).